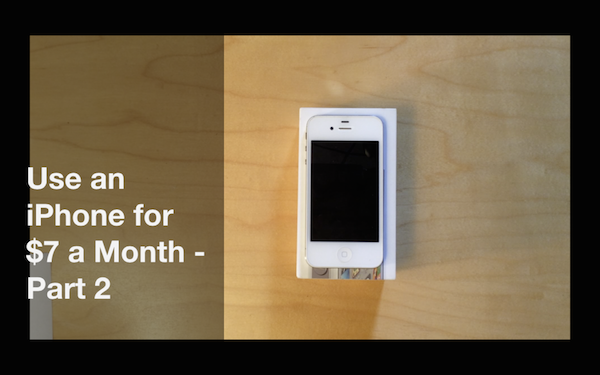 I just posted Part 2 of my Use an iPhone for $7 a Month video on the smartphonematters YouTube channel. In Part 1, I wondered if it was possible to use an iPhone for $7 a month after seeing Tracfone Wireless advertise smartphone plans starting at $7 a month. Tracefone sells several inexpensive Android smartphones, but they don’t offer the iPhone. Tracfone does have a Bring Your Own Smartphone program, so that is what I decided to do. I bought a used Verizon iPhone 4s and my plan is to use that. In my case, I wanted to transfer an existing Tracfone wireless phone number to this iPhone and then choose the $7 a month plan. Your case may be different, if you plan to transfer your number from another wireless company to Tracfone and we will talk about that a little later. Before starting I went to the Tracfone web site and signed up for an online account for the existing Tracfone phone I had. After that I went to the Straight Talk wireless BYOP page, and clicked the getting started button. Settings->General->About. The MEID is a long number listed on that page. After entering the MEID and Zip code, I clicked Continue. If your phone is compatible, the web site displays three options for getting a Network Access Code. I needed to buy a code, to register my BYOP iPhone with Tracfone. The website had three options. First, use a network access code, that came from a retail package. Second, buy a code online. Third, upgrade and currently active BYOP phone to a new BYOP phone. I chose the second option to buy the network access code online. The network access code cost $10.69. Its was $9.99 plus 70 cents state sales tax. After registering the phone, I was able to log into the Tracfone account I created earlier and add this new iPhone to the account. Once the phone was added to the account, I chose the option to transfer the phone number and minutes to the iPhone. To transfer the service, I needed to enter some codes from the Tracfone website. I had to get these code numbers from the currently active Tracfone. The website provided detailed instructions about how to get those codes from the currently active phone. Getting these codes was called Code Entry mode, I have no idea what that means. The instructions were very clear. Once I entered those codes into the web site, the transfer started. After that, I had to wait for the currently active Tracfone to stop working. Once the current phone stopped working, I dialed *22890 on the iPhone and heard a confirmation message. The instructions said I’d have to make a call from the phone before it activation was complete. I made a call, but it didn’t go through. I got some other message, about setting up the phone. At this point, I could dial my Tracfone iPhone, but not make calls. I looked on my account page on the Tracfone website, it said to verify the iPhone’s Tracfone number. Once I did that, I could make and receive calls from the Tracfone iPhone. In the video, I show that I can make and receive phone calls. I am able to send and receive SMS text messages. I made sure iMessage was off so that the messages were send using SMS rather than using my data connection. I also show I am able to send and receive MMS picture messages. When I first activated the phone, I could send but not receive picture messages. It took between 12 and 24 hours before I could receive picture messages. I was able to browse the web. I loaded smartphonematters using Safari. I also checked my cellular data speed using the speediest app. My data speeds were very slow at 0.27 mbps down and upload speed of .62 mbps. These speeds are very slow for 3G. I ran some additional tests and got similar results. I’ll need to investigate why this is so slow. I am going to say that the $7 a month iPhone plan is possible. I was able to activate and transfer an existing Tracfone phone number to the iPhone. I never needed to pick a plan because all of the minutes were carried from the existing phone to the the iPhone. But, I say no reason I simply could have not chosen the $7 plan for this phone. The $7 plan isn’t for everyone. Your phone will really only be for emergency use. You’ll have to choose the $19.90 Pay As You Go Plan. That plan has 60 minutes of talk, 60 text messages, and 60 mb of data for 90 days. That averages 20 minutes talk, 20 texts, and 20mb of data per month. That is a really low usage plan. They also have a $9.99 Monthly Value plan. That plan has 50 minutes talk, 50 texts, and 50 mb of data for 30 days. On both plans, the minutes carry over if you don’t use them and keep the phone active. To get a $7 a month plan, you need to own your own iPhone. I had to buy one. I spent $175 for the phone. $10 for a bumper case, $28 for my Zag invisible shield for a total of $213. For one year the $7 a month plan would cost $19.99 x 4 (thats 4 payments for the $19.99 90 day Pay As You Go plan). The total comes to 292.86 for the year, or $24.41 a month. This doesn’t include state sales tax for the Tracfone service. In Massachusetts, with 6.25% sales tax, the Tracfone service would cost $84.96 for the year, bringing the total to $297.96 for the year or $24.83 a month. Your costs will change depending on your state’s sales tax rates. Also, if you pay for your service credit card online or choose an auto pay option, Tracfone might add small fees like 911 service charge, Federal Universal Service Fee, and Regulatory Cost Recovery. On my Straight Talk plan, these fees cost me an extra $1.60 a month. Tracfone may charge these fees as well. If you want a smartphone but don’t need to use it that often, these low cost Tracfone plans are a great option. We have an iPhone 4 and want to use it mostly for searching the internet. Would the data plan work any faster with the $19.99? Faster than some other Tracfone plan? No i don’t think so. You need a phone that supports LTE like an iPhone 5 or later. Why pay $7 in addition to the 19.99 $ every 90 days ? 19.99 for 90 days averages out to $6.66 a month, or about $7 a month. Bob, I have a tracfone now that I usually occasionally and I purchase the one year plan each year and that hold me over with many units to spare. If I get an Iphone 5 and transfer the minutes, like you did, does the one year plan look different than one for a non smartphone tracfone? In other words, does the one year card provide units or does it specify what I am allocated for each sections, like texts, calls and web surfing? and is sending a text the same “price” as calling someone. Now when I send or receive a text, it’s about .3 units each. many thanks..I loved your video and am on the verge of getting an iphone to replace my 4 year old tracfone. I am happy to hear that you found my video helpful. I am not certain how your existing minutes would move over to a smartphone. In my video I transferred the balance from a basic flip phone that was getting double minutes on a monthly value plan. It seems that the way that that plan works is that if you have say 100 minutes, you get 100 minutes of talk, 100 texts, and 100 mb of data for the web and email. Ann, the owner of the phone in the video, never used texts or data just the minutes. She now gets triple minutes because it is a smartphone, but mostly keeps the data turned off and uses Wi-Fi for sending messages and pictures. A couple of other things to keep in mind. In my video, I used and iPhone 4s. At the time, Tracfone did not support BYOP for the iPhone 5. They do now. You’ll need a Verizon iPhone, a Tracfone 4G LTE SIM card, and you must check the MEID of the phone with tracfone to know if it is eligible. You’ll need to check this online. I also recommend calling them. I just checked a few minutes ago and it looks like tracfone is also going to start offering support for the ATT network as well. It doesn’t look as if the SIMs are available yet. But its coming soon. Do you have a preference for Verizon or ATT network. Do you know which network your current phone is using? what is nice about the ATT option is that it any ATT phone works on an ATT network and you don’t need to worry about checking the MEID. Let me know what you think? You might have some really nice options soon. We have 2 Tracfone flip phones. We want the BYOP iPhone 6S to bring to Tracfone like you did. So where can we buy the used iphone 6 S ( on Amazon, Ebay ) and how do we know before we buy these used iphone 6 S if the MEID are eligible for Tracfone? Are you looking to buy 2 phones? And are you looking for the iPhone 6 or 6s? The plural of iPhone 6 and iPhone 6s is confusing. To answer your question, there are plenty of used iPhone 6 phones for sale on eBay. There are less iPhone 6s phones on sale eBay as the phone is only been on the market since September. tracfone now offers service on either the Verizon network or Att network. If you want to use the verizon network, you need to check the meid. You should ask the seller for the meid before buying, not all sellers may be able to provide this, you should also buy from a seller with a return policy. You don’t need the meid for tracfones att network. The sim should work in any att or Verizon iPhone 6 or 6s. Since both of these models are less than two years old, I’d get the sellers assurance that the phones are no longer on contract. Is there anyway the iPhone 5s or 6 could work on tracfone if they just operated on 3G speeds instead of 4G? Not that I am aware of. There are other low cost options. let me know if you would like to discuss them. I would like to learn about other low cost options. You can browse through some of the article at smartphonematters. What type of budget do you have and what type of service are you looking for? I managed to do this a few months ago, for less money. I bought a mint 64GB iPhone 4s on eBay for $128. It included a Zagg screen protector and back protection, the original box with original documents, charger, cable and headphones, all still in plastic . It also came with two good cases. I already had a Tracfone account, so activation was easy, but took about two hours . This was much slower than any of my previous activations. I did not transfer my number and minutes until I was sure that the iPnone would work satisfactorily.. I activated it with a 30 day/30 minute. plan for about $12. This actually got me 90/90/90 since the iPhone is a triple minute device. I have just bought a 1 year card which gives me another 1200/1200/1200 for less than$110. Since I have another phone this should be enough. The cost of using the phone works out to $8 per month. Based on the value of older iPhones, I expect to be able to sell this phone for at least $75 in a year, so my annual cost including the phone is about $195. This is about $16 per month, which I consider a bargain. People who have been used to A7 or A8 devices would probably find using the A5 iPnone 4s pretty slow, but I find it very acceptable, especially for the price. Thanks so much for that info! I was really wondering if it would triple the minutes like the other smartphones. Has it continued to do well for you? Yes it seems to be. Great experience data by Bob Thompson and Buckley. I would like to add that I just got the iPhone 4s in mint condition with clean ESN. Tracfone refused initially claiming they did not offer such plan; however, when consulting a supervisor he checked the MEID number and apologized saying that it did work with their pay as you go plan. The phone was registered but when I called the *22890 number hours later it still would not activate the phone. A technician at Tracfone indicated that their transfer at their end was complete including all my minutes and that I should call Apple. I did and the rep checked the phone to see if it had been reported lost or stolen and it had not. Then he advised me to call Verizon and see what was going on. Well, it turned out that the phone was still active on their records and they could do nothing about it. I asked the rep is the active owner was me or someone else and he said it was under another name. More searches on the net showed that if the prior owner owed the provider any monies, the account would remain active or on a black-list. Verizon’s rep did not mention a black-list. Now I have to see if the seller will refund the monies on the premise that – even though the phone was not sold to be used with Tracfone – it cannot be used with the advertised Verizon n/w either. My point for other potential buyers is that a clean ESN does not mean much if there is a debt to be paid to the company that the phone is locked to. Other locked phones can be unlocked if there is no pending contract or other debt – as confirmed by a company in the business of unlocking phones. Can anyone add to this… is there a way to solve this situation? From other sites I learned that even if one offers to pay the debt – assuming that they would disclose it and that it was an acceptable amount – the service provider does not accept it. Thanks for this good service. Sorry to hear about your your troubles with the phone. Unfortunately, this is one of the problems with used Verizon smartphones. In general I prefer using the ATT or TMobile networks. My understanding is that phones from accounts in poor standing will eventually be marked with a bad ESN. Where did you buy it from? What terms did the seller offer? If you can’t use the phone even with Verizon, the seller should have informed you. Did you ever get any resolution on your Verizon phone? I am not sure I understand. The Tracfone website tells you your phone might be compatible an then asks you for your birth date? Are you willing to share your phone MEID and your zip code with me and I can check it out for you. You can email them to me at bob at (the name of my website). Why can’t I access the PART I of this story?(i.e. Using an iPhone for $7 a Month – Part 1) I’ve tried several LINKS on your website, but they all 404 out. You are right. There is something broken on the web site. I am trying to figure out the problem. I’ll reply when its fixed. For now, if you go to my YouTube channel you can watch the video there. Thanks for reporting the broken link. I fixed the issue. Let me know if the link still doesn’t work for you. I have a Verizon iphone 4 that I have been using for over a year on Straight talk- NO issues. Well I recently purchased another used iphone 4 (Verizon) that I want to activate on my Straight talk line and disconnect the original one. Today, I logged in my acct on straight talks website, went through the same prompts you went trough.. Providing the MEID, zip code, Access code etc and it’s stating that the activation is still in process. It’s been about 10 hours and my “new” iPhone still isn’t activated. I’ve called several times and they have created tickets to see what the issue is but at the same time they are telling me it could take anywhere from 1 hour, 24 hours or 2 days to fully activate. I keep getting the “We are unable to activate your phone” message when I call *22890. So my question is.. HOW LONG DID IT TAKE YOUR iphone to start working? Not too long. I did this on Tracfone, not Straight Talk, but it should be the same as they are the same company. 1. Log in to your Straight Talk account. 2. Does it show both phones in your account? 3. Is the old phone is still active, there is an issue on their end. My iPhone 4s took two hours to activate, about four times as long as my Android phone, which was a normal Tracfone. It takes longer when there are a lot of other people are activating. I activated mine at 10PM Pacific on a Wednesday, normally a very good time. A friend tried to activate her phone around midday on a Saturday and it took almost 7 hours.. The only thing that is sure is that it is very unpredictable. I would wait at least overnight before trying to get help on the phone. This is always tedious. Thanks for taking the time to share your experience using an iPhone 4s with Tracfone. You got a great deal on that iPhone. I haven’t checked recently but I’d image iPhone 4s prices are dropping now that the iPhone 6 has been released. At $195 for a year, that is a great smartphone deal. What I love about this deal is you have a great phone, a great camera, and access to great apps at that price. Your correct to point out that activations can take some time. I usually caution readers to make sure to plan extra time for these activations. Once again, thanks for sharing your story with the other readers. Bob – I thought it ironic that you paid 4 times the $7 monthly fee in order to get the invisible shield. I have been a fan of zagg for years and put military-film-style protection on all portable electronics. But I have found several alternatives that I consider equivalent (all “wet application” high-strength films). Look on Amazon for Skinomi or Tech Armor brand – identical in all ways to Zagg’s products. I like skinomi best as they have a “case friendly” version which is slightly smaller and therefore does not interfere with the edges of a phone case that wrap onto the front face of the phone. All of these screen protector products can be had for 5 or 6 bucks if you look around a bit. (I only get the screen protection as the rest and sides are protected by the case). You are right. If I had the time, I would have used a coupon code and ordered my Invisible Shield online. I paid full retail because I had to ship the phone out. The phone was for someone else, and they had no cell phone after I did the number transfer. I didn’t even have time to go to the Zagg booth in the mall to buy one. If you are going to pay full retail for an invisible shield you might as well have it installed by the Zagg clerk. I haven’t used Skinomi or Tech Armor. I have heard that bestskinever are pretty good too. I have used the Invisible Shield warranty replacement many times. Either ordering replacement in the mail or replaced in the Zagg booth in the mall for a small fee. The Invisible Shield comes in full body and case friendly too. I use the case friendly myself because I am constantly taking my phones in and out of cases. I has a full body in the video because that was all I could find in Staples that day. The bumper was installed on that phone and I don’t expect it to ever be taken off so the edges could be ok. Thanks for sharing the tip on skinomi. Would like to know of anyone with Virgin or Sprint who has had success setting this up, if at all possible for the $7 monthly plan. I don’t know. You can BYOP both Verizon and sprint iPhone 4 and 4s to net10 and straight talk. Tracfone, net10, and straight talk are all owned by the same company. Enter your meid into the web site and it will tell you if the phone is eligible. I plan to find out. I am going to guess it is. I think the web site would say Verizon phones only if sprint phones didn’t work. I’ll post she I find out more. Remember this only works for a Verizon IPHONE 4GS or older model (which is CDMA). You can also set up an account with REDPOCKET CDMA for $20 a month that has a lot more voice-text-data to actually be useful. That is still on verizon cell towers. Do not be confused with REDPOCKET GSM as that is way more costly. Have found that a Iphone 4GS can be bought around $150, but a Iphone 3GS can be bought for $50 on ebay. You are correct. I have written a lot about using gsm iPhones with prepaid wireless from straight talk, net10, att, tmobile, and h20 wireless. I like these plans for a few reasons. Many readers have told me they live in areas where only the Verizon network was adequate coverage. I find that both used sprint and Verizon iPhone 4 and 4s sell for a lot less than he gsm models. I like the 4s because it has a great camera and the phone will be upgradable to iOS 8. While you can buy a 3GS for 50 bucks, it isn’t upgradable past iOS 6. I’ll have to check out redpocket CDMA. Thanks for the tip.